Every year we get a new smartphone from Samsung in the Galaxy S line with top notch specifications, a great display, and a good camera, but packaged in a plastic, cheap-looking body with a bloated and slow user-interface. This year Samsung has finally listened to the critics and redesigned the Galaxy S line to provide a well performing smartphone that looks good and isn’t held back as much by its software. The Samsung Galaxy S6 is a premium smartphone that takes excellent pictures, has an amazing display, and performs well. However, mediocre battery life and poor multitasking detract from an otherwise great phone. 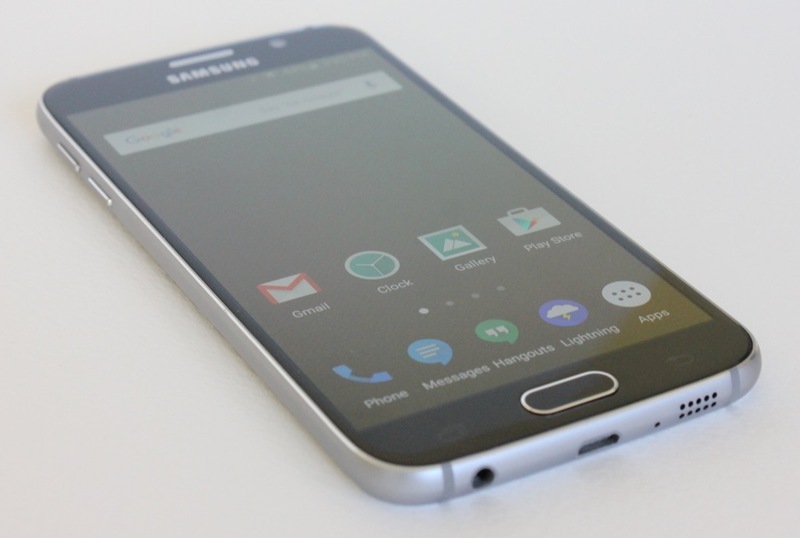 Samsung completely redesigned the Galaxy S flagship phone in 2015. In the past the Galaxy S line has been known for cheap-feeling build quality, but that has changed: plastic has been replaced with glass and metal. The front and back are covered with Corning Gorilla Glass 4 and have a subtle curve down towards chamfered metal sides. However, the glass on the back is a fingerprint magnet and very slippery. Because of this, we wish Samsung had opted to use metal on the back instead of glass. Unless you are extremely careful, using a skin or case on the back is a good idea. The Galaxy S6 is very thin at only 6.8 mm which is 1 mm thinner than the Apple iPhone 6, and weighs in at 138 grams. The flimsy or cheap feeling of previous Samsung phones is gone as the Galaxy S6 feels solid and looks premium. The camera requires a bit more space so there is a bump surrounding the camera of a little more than a millimeter. The camera bump prevents the phone from lying completely flat on its back, but is not as bothersome as it sounds. The phone is stable enough when lying on a flat surface. However, we would have preferred a slightly thicker phone with a back that was flush with the camera if it came along with increased battery capacity. The trend of ever thinner designs, unfortunately, often compromises battery life. On the top there is a window for the infrared blaster and a microphone for noise cancelation. The bottom houses a single speaker, the micro USB connector, another microphone, and the headphone jack. The volume buttons are on the left side with the power/lock button on the right side. All the buttons have a great tactile response. The Galaxy S6’s fingerprint scanner doubles as a home button, it fits just underneath the display and is flanked by capacitive backlit navigation buttons. Unlike last year’s Galaxy S5 that required a swipe, the fingerprint scanner works more like Apple’s Touch ID. You just press your finger on the home button and it unlocks the phone. It works pretty well, but is not perfect – more about that later. ese tradeoffs. We may have felt differently regarding the expandable storage if the baseline storage capacity was still only 16GB, but fortunately Samsung increased the lowest storage tier to a more reasonable 32GB. Samsung’s AMOLED (active-matrix organic light-emitting diode) display on the Galaxy S6 is the best screen we have seen on any smartphone to date. With a total resolution of 2560 x 1440 in a 5.1 inch screen yields a ridiculous pixel density of 577 pixels per inch. If you are trying to spot individual pixels with the naked eye, good luck, as we couldn’t see any no matter how close we held the phone. Although there is no need for a 1440p display at this size since it impacts battery life much more than a 1080p display would, there is no denying that it is a beautiful screen. 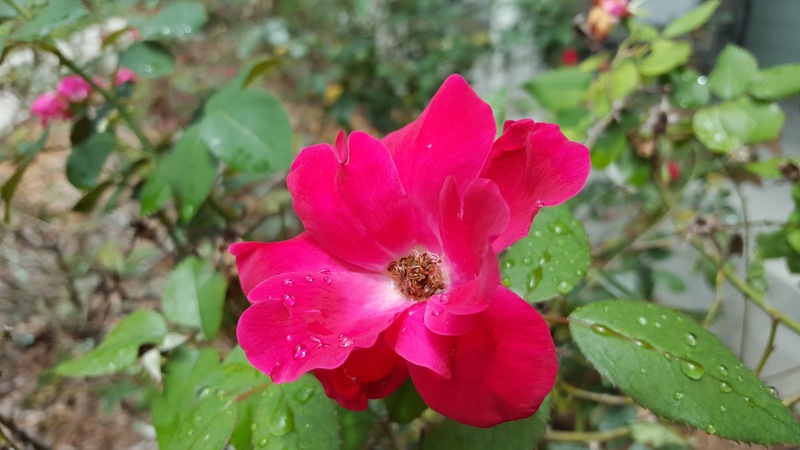 To the naked eye it is more detailed than the iPhone 6s and has much better color reproduction and brightness than older AMOLED panels on the Galaxy S5, Nexus 6, or Moto X (2014). Samsung has finally corrected the issues found most often in AMOLED panels: poor brightness and inaccurate colors. The Galaxy S6 display can get so bright that it is easily viewable in sunlight and the colors are accurate. The adaptive brightness setting works extremely well, able to get very dim in completely dark environments to automatically increasing brightness even higher than the manual mode’s full brightness setting in sunlight. This is a little feature that Samsung has done well, much better than stock Android. The viewing angles are excellent and there is no noticeable color shift until you reach extreme angles. 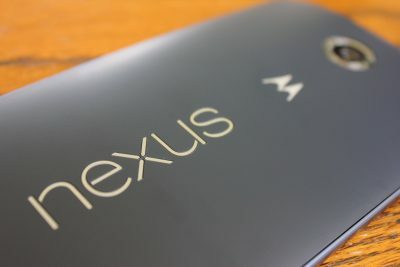 Since we started using this phone in April 2015 there has been no sign of burn-in which is something that has been present by this time on some of the other AMOLED phones we have used, like the 2014 Moto X and Nexus 6. For years the image quality on Android phones has fallen behind Apple’s latest iPhones, often by wide margins, but not anymore. 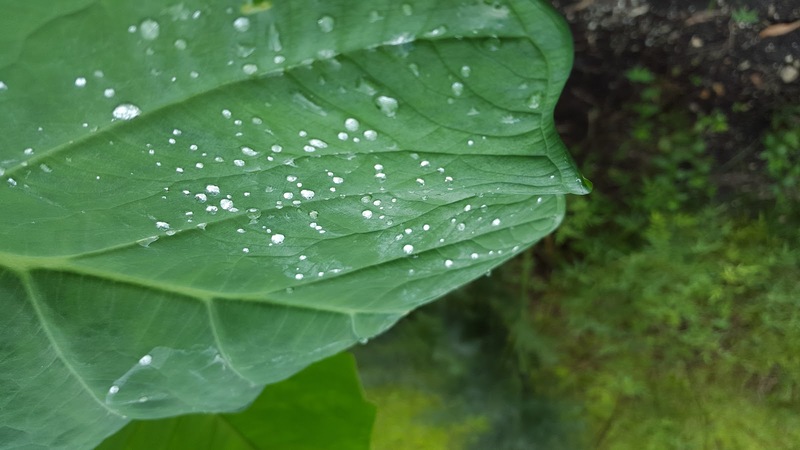 The Galaxy S6 takes incredibly good pictures, even better than the excellent iPhone 6s in many scenarios. 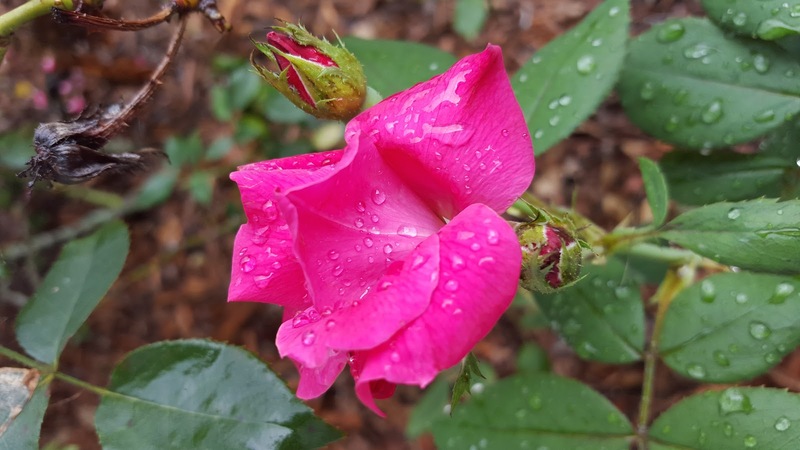 Checkout the gallery below – many of these pictures are the best we have seen on any smartphone to date. The rear facing camera shoots 16 megapixel photos through a 1.9 aperture lens and sports optical image stabilization. 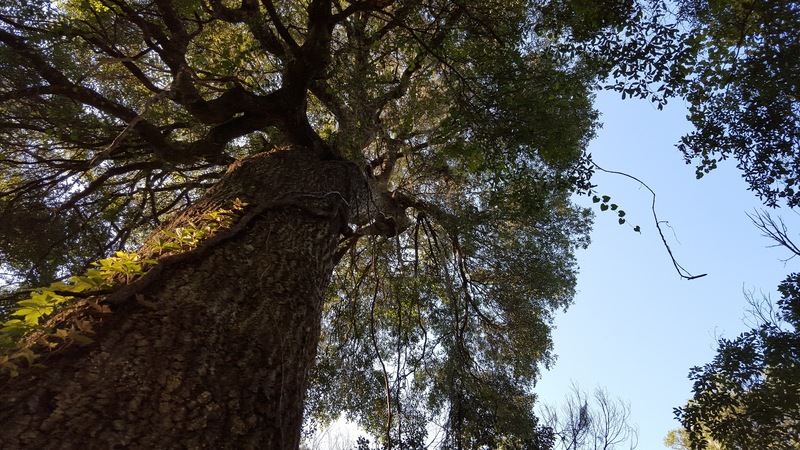 Interestingly, Samsung chose to make the full resolution photos 16:9 instead of the standard 4:3 ratio. 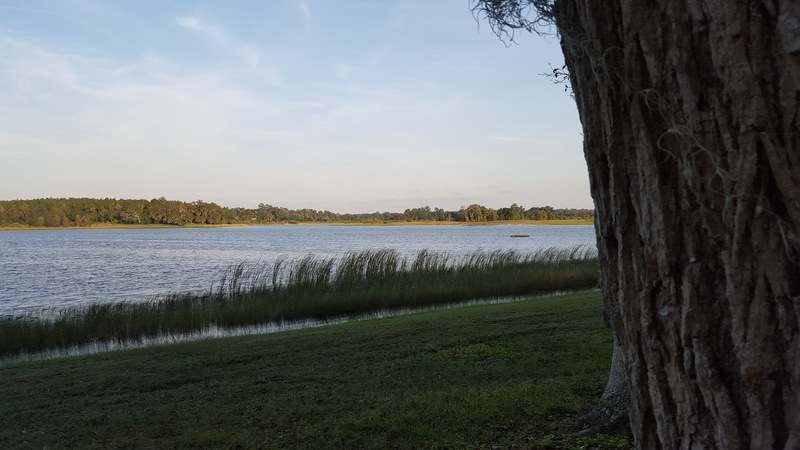 The dynamic range is good for a smartphone camera and the auto high dynamic range (HDR) setting works well to determine when a single exposure won’t cut it. 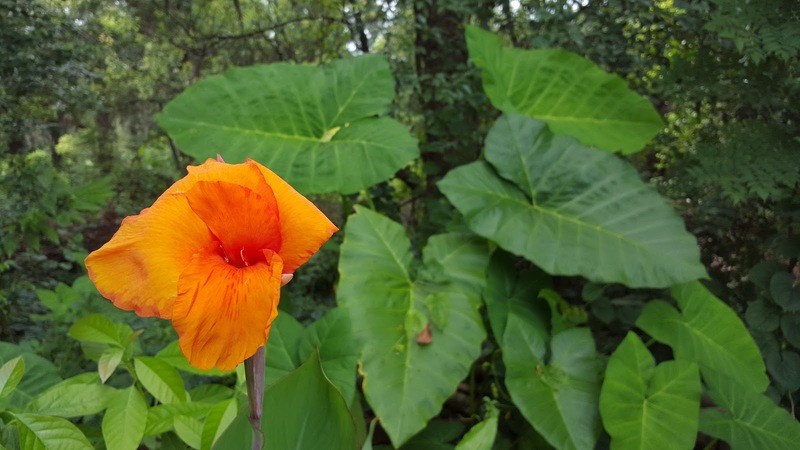 There are a number of settings in the camera app that you can change to fine tune images, but the auto mode is excellent and is what we used for all of the images below. There is also a shortcut to open the camera app: double tap the home button and the camera opens and is ready to shoot almost instantly. The camera app takes pictures very quickly as well. Video recording is solid overall, with the ability to shoot up to 4K (ultra HD or 3840 x 2160) at 30 frames per second (fps). Optical image stabilization helps remove the shakiness of handheld videos. There is a tracking autofocus feature that lets you tap to select a subject and the camera will remain focused on that subject regardless of where it moves within the frame. 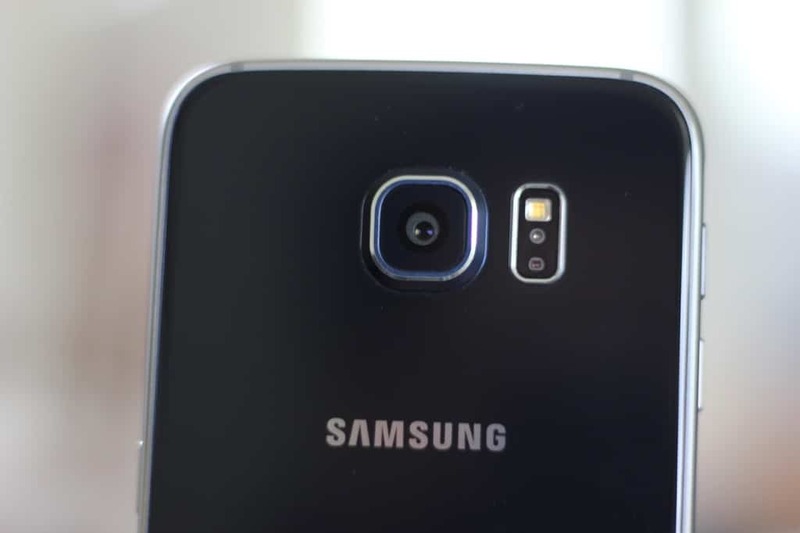 Slow motion video on the Galaxy S6 is somewhat disappointing. It has the ability to shoot 120 fps at 1080p, or 240 fps at 720p, similar to the iPhone 6s and Nexus 6p, but the the image quality is not very good. The 240 fps video is especially poor quality, looking more like upscaled 480p video at best. Samsung’s take on Android, previously known as TouchWiz, has resulted in a big, bloated skin in the past, but this has been improved. The stock design is very colorful and bright (a bit too cartoonish for us) and cluttered, but can be changed with themes. 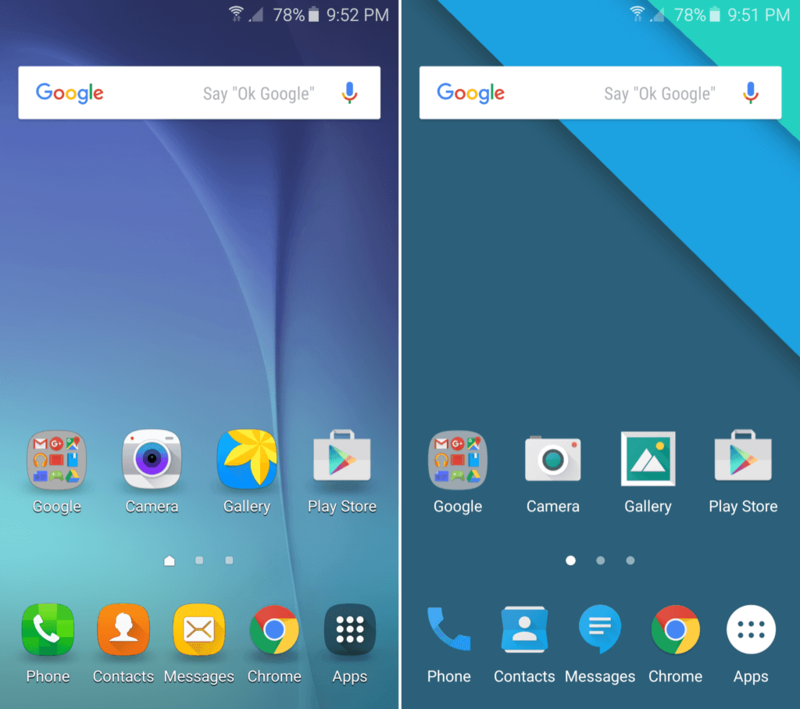 There are material design themes that make the Galaxy S6 look similar to a stock Android design. You can find these in the built-in theme app. The image below shows screenshots of the stock theme on the left and a material design theme on the right. But it is Samsung TouchWiz, so does it lag and gobble up huge amounts of RAM? 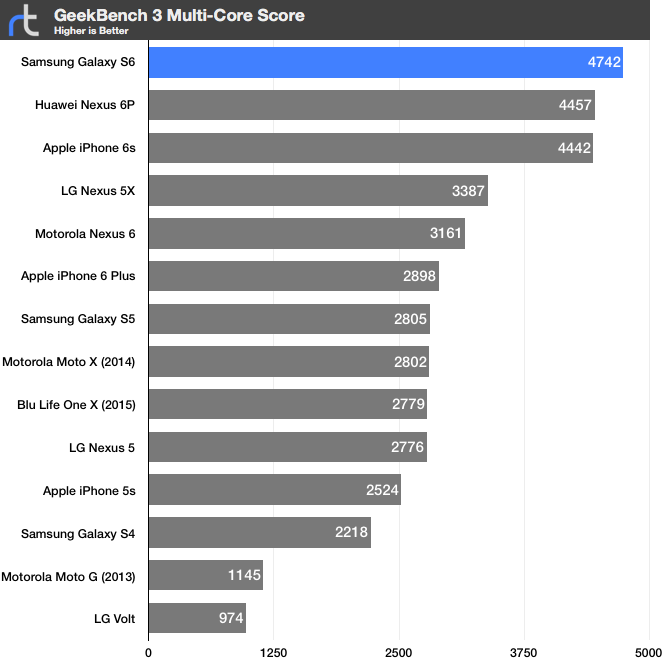 We will discuss Samsung’s software performance more in the next section, but essentially, the performance is very good, but the system does use an inordinate amount of RAM. With the stock launcher, instead of finding Google Now on the leftmost home screen, there is the Briefing app, a Flipboard powered news reader. Luckily you can easily disable the Briefing home screen or go even further and simply install another launcher. The amount of bloatware will largely depend on where you purchase your Galaxy S6. The carriers will have various junk apps added to their specific versions. The unlocked international version, model SM-G920I, is the phone we are reviewing. It has some 3rd party bloatware apps that we disabled: Briefing, Facebook, Facebook Messenger, OneDrive, OneNote, and Peel Smart Remote – nothing egregious here, especially compared to previous Samsung Galaxy phones and carrier models. After we purchased the international version, Samsung started selling an unlocked U.S. Galaxy S6 which we recommend over the international version if you are in the United States. Samsung Pay is Samsung’s mobile payment system similar to Android or Apple Pay that use NFC (near-field communication) enabled payments with one major addition. The benefit of Samsung Pay over Android Pay is that in addition to NFC payments you can also use your phone to pay at “regular” credit card terminals. ,” or MST, that emulates this process and therefore can be used at almost any terminal. The advantage to Samsung Pay over using your actual cards is primarily security and convenience. The payment is not completed without your fingerprint and a process called tokenization occurs which sends a random, temporary number to authorize the payment instead of using your actual credit card number. That way, even if the vendor stores the transaction data and is compromised, the hackers will only get an encrypted token that cannot be used to make fraudulent purchases. 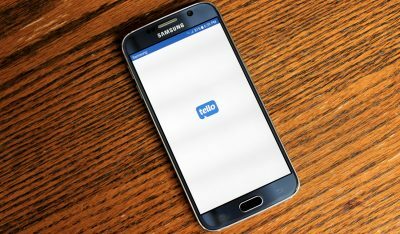 Since the Galaxy S6 can make mobile payments on older credit card terminals, it can be awkward to use your phone to pay in places that are unaccustomed to mobile payments. If you are in a store that has only ever used a swipe-based credit card terminal, it may be wise to explain what you are doing before waving your phone over their terminal. That leads us to discussing the fingerprint scanner. The scanner is pretty good but occasionally fails to recognize fingerprints, usually requiring a reorientation of the finger to work. We created an error detection utility that has demonstrated an error rate of just under 5% for the scanner – it’s not perfect, but it works pretty well. It works about as well as Apple’s fingerprint scanner, Touch ID, on the iPhone 5s, but is not nearly as fast or accurate as Touch ID on the newest iPhone 6s or the scanners in the new Nexus phones. The occasional errors are not a deal-breaker to us, and the scanner provides an excellent way to unlock your phone securely. In addition to unlocking the phone and making payments, a couple of password managers like Lastpass and Dashlane work with the fingerprint scanner, but that’s about it for 3rd party functionality. When the Galaxy S6 gets updated to Android 6.0 Marshmallow, we suspect the fingerprint situation to improve as fingerprint scanning is built in to the operating system and is available to 3rd party apps to utilize. The Galaxy S6 actually has a small pulse oximeter that uses a special LED and sensor below the camera flash LED on the back of the phone to measure heart rate and estimate the amount of oxygen in your blood. This clearly is not a medical grade sensor and we wouldn’t recommend it for anyone who actually needs to know their oxygen saturation, but it works well enough for measuring your heart rate. If activated you can quickly press the power button three times in rapid success which can then send out a messages to up to four contacts. 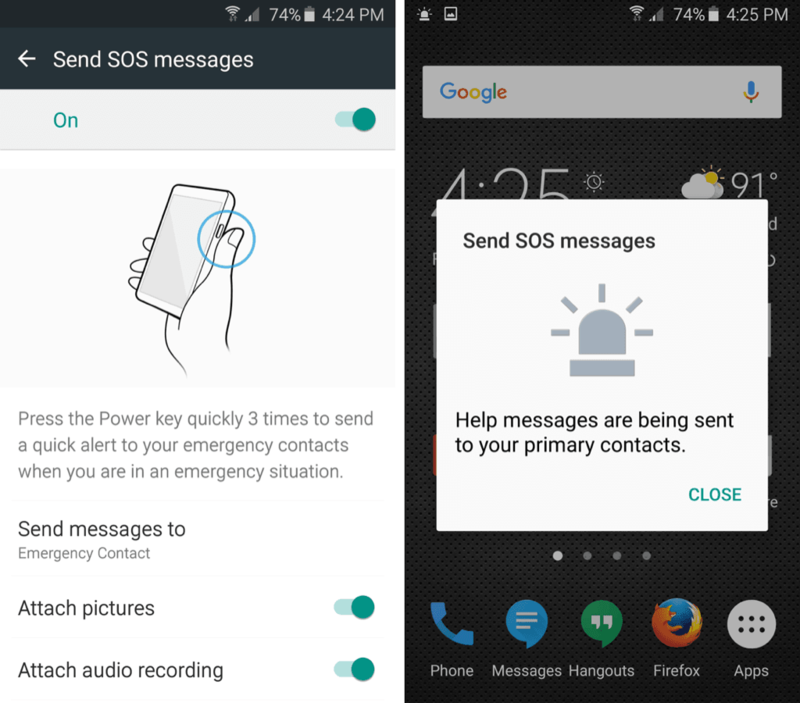 If you activate all the options shown below, your phone will rapidly send out a text message that says, “SOS!” followed by a Google maps link to your location. If you choose it will also record a 5 second audio clip and a photo from both the front and rear facing cameras. Hopefully this is something that you will never need, but it is a nice feature to have. The infrared emitter allows you use remote control apps to control your TV setup if desired. We don’t use this feature often, but in our testing it worked well. 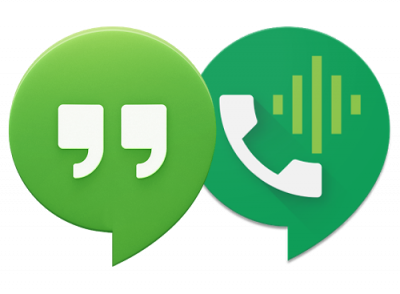 If you plan to use your phone as a remote, we would recommend using one of the many remote control apps available on the Google Play Store rather than the included app as it is not as functional and requires a lot of your personal information. Instead of a Qualcomm chip, Samsung is using their own processor, the Exynos 7420, built on a 14nm process. In our testing it does not overheat or thermal throttle like the Qualcomm Snapdragon 810. This chip is very fast, especially at multi-core tasks. 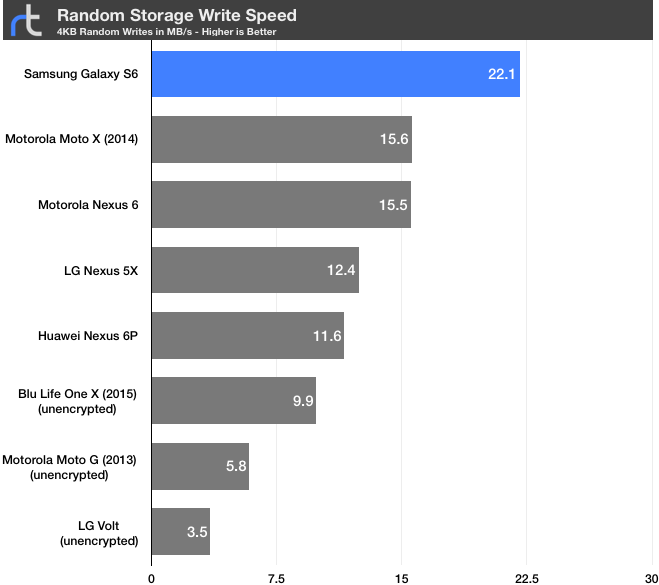 Performance of the Galaxy S6 is excellent. For the most part the experience is smooth and quick – apps open quickly, scrolling is fluid, and graphic intensive apps and games load quickly and look great. Occasionally there is some lag or jitter that is noticeable, but it isn’t very bad. 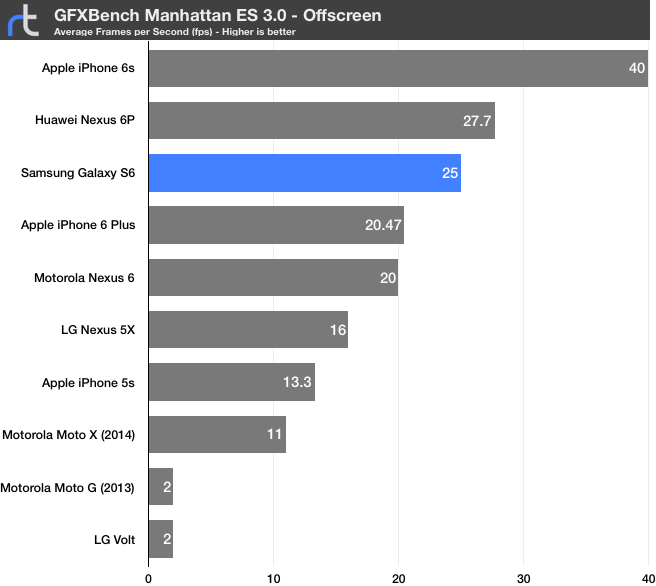 The occasional hiccups are most likely from poor software optimization considering how well this phone performs in benchmarks. 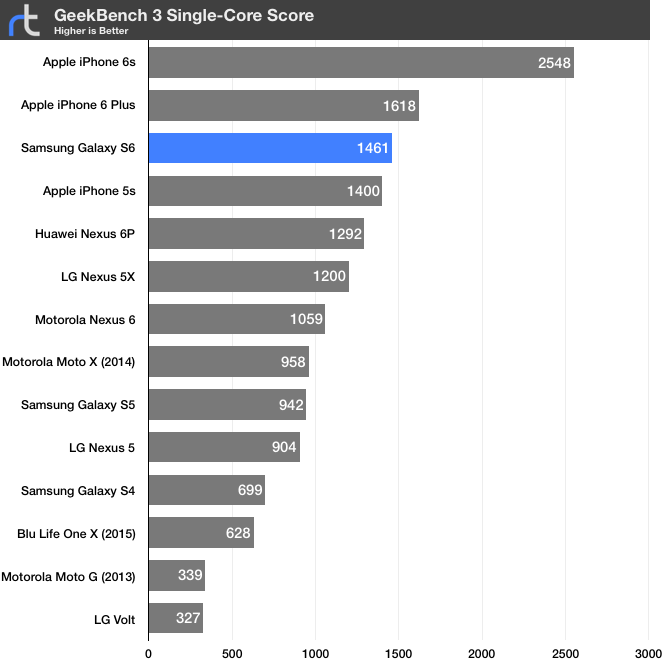 Geekbench is a popular benchmark that measures CPU performance. 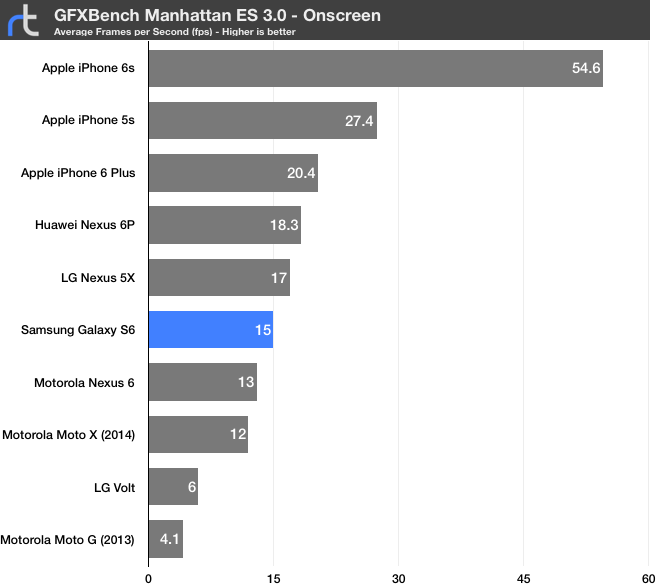 We tested the Galaxy S6 using Geekbench 3. The single and multi-core performance are shown in the graphs below. In single core tasks the Galaxy S6 does extremely well, beating all the other Android phones we have tested. However, the latest Apple A-Series chips are better at single-threaded workloads. The Galaxy S6, with its eight cores, is currently the highest scoring phone we have tested in multi-threaded workloads. 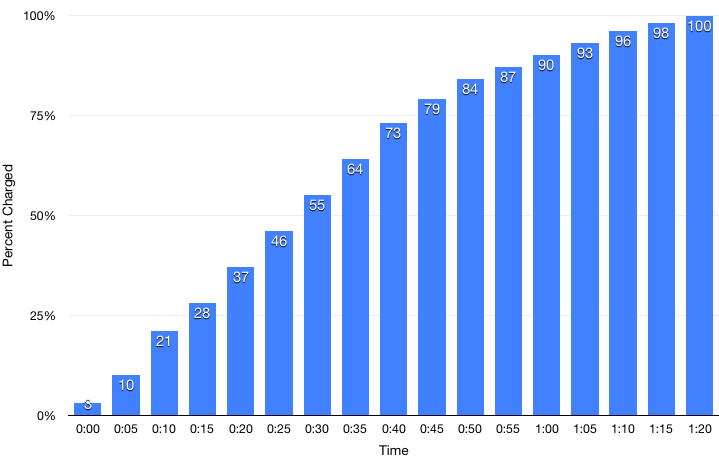 GFXBench shows the average frames per second rendered onscreen and offscreen for a specific scene. We used the Manahattan ES 3.0 test below. At first glance, it appears that the Galaxy S6 is not very impressive in the graphics department. It is getting absolutely crushed by the iPhones, even the 5s from 2013! But, we have to take this in context as this onscreen test means that the Galaxy S6 has to render and output the scene to its native resolution of 2560 x 1440, a total of 3,686,400 pixels. For comparison, the iPhone 6s has a much lower resolution of 1334 x 750 for a total of 1,000,500 pixels. The second test provides a more even playing field rendering the scene offscreen at 1080p regardless of the phone’s native resolution. In the offscreen test the Galaxy S6 does well but is unable to beat the newer Nexus 6p and iPhone 6s. 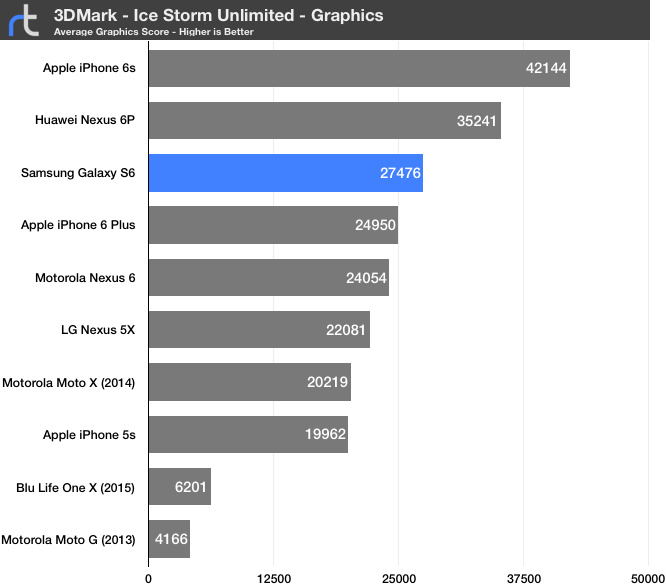 In 3DMark we used the Ice Storm Unlimited test. This is similar to the previous test as the scene is rendered offscreen, this time at 720p. 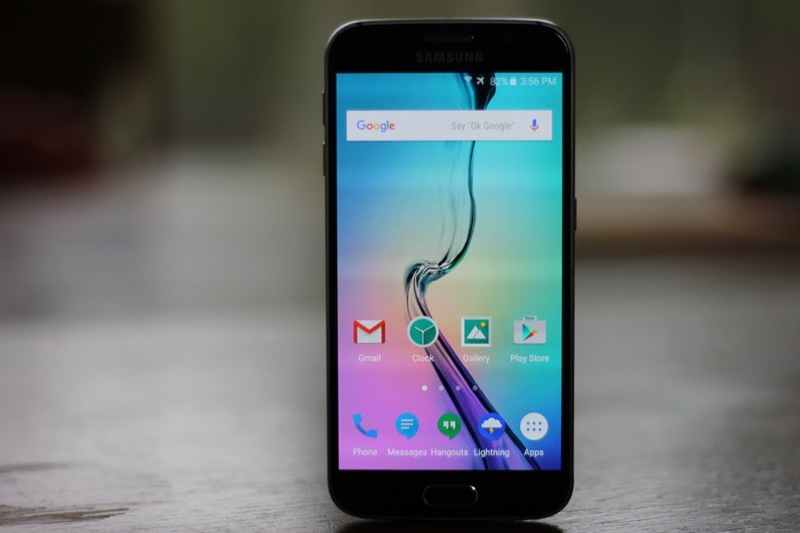 Again, the Galaxy S6 does well, but comes up short compared to the Nexus 6p and iPhone 6s. ice can utilize its storage will impact the general user experience – especially load times when opening apps that are not stored in RAM. All devices are encrypted unless stated otherwise. 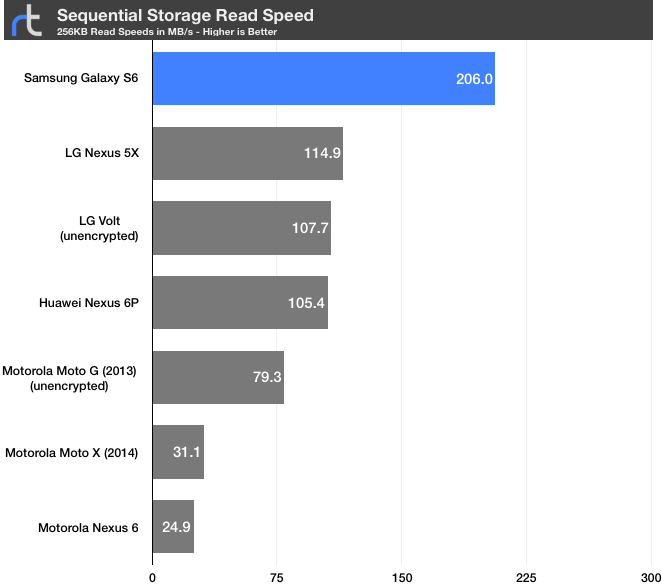 In the sequential and random read tests, the Samsung Galaxy S6 is significantly faster than other Android phones. 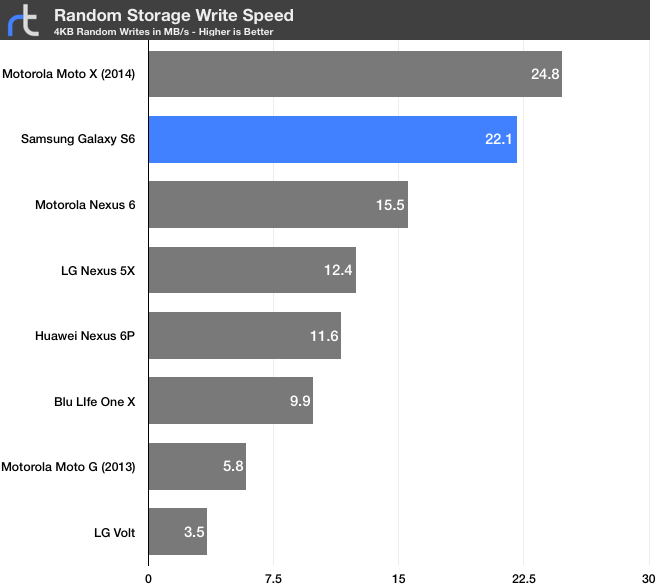 The Galaxy S6 also leads the pack in write speeds. The S6 is the first phone to ship with a new storage interface, called Universal Flash Storage (UFS) that is newer and faster than the eMMC standard used on most other phones. 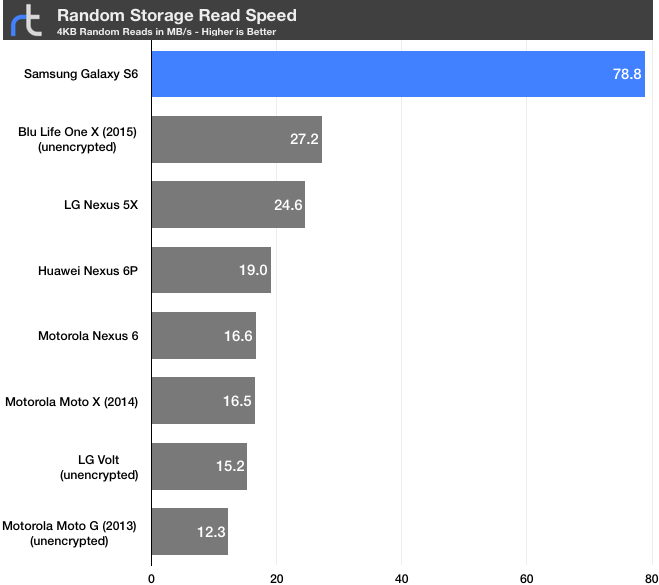 Our only real complaint regarding performance is that Samsung’s version of Android is a memory hog. 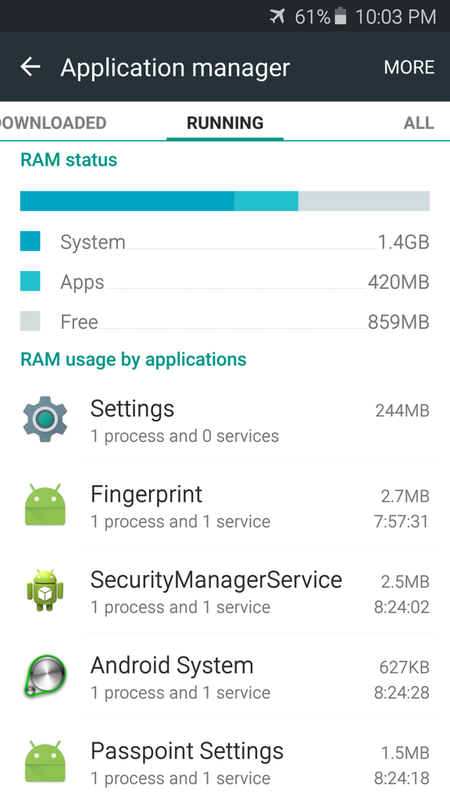 Even though the Galaxy S6 has 3GB of total RAM, there is only about 1GB of RAM available with the remaining 2GB being used by the system and Samsung apps. As you can see in the screenshot below, with only basic system apps running, our Galaxy S6 has less than 1GB of free RAM to utilize. This is surprising as a stock Android phone with the same version of Android 5.1.1 only uses about 1GB of RAM. Why does Samsung’s version of Android gobble up twice as much RAM as stock Android? We don’t know for sure, but our bet is on poor software optimization. But how does this affect everyday use? Basically, the Galaxy S6 will purge apps, browser tabs, or running processes from memory fairly quickly because it simply doesn’t have much free RAM to utilize. The Samsung Android system also seems to be somewhat aggressive in purging apps from RAM compared to stock Android. This results in multitasking performance that is not as instantaneous as you would expect. For example, opening a few apps in succession and then returning to the first app opened will require the app to completely reload instead of returning immediately, as it would if it had remained in memory. The same thing can occur with multiple tabs open in the Chrome browser – instead of being able to switch back to a previously opened page right where you left off, the page will have to reload. Although difficult to directly measure, we expect this constant reloading of apps and webpages really hurts battery life. It is much more efficient to keep an app in RAM than to reload it every time it is used. At first we were hopeful that Samsung would issue a software update that would at least tone down the aggressive RAM management, but it never happened. Call quality on the Galaxy S6 is very good. 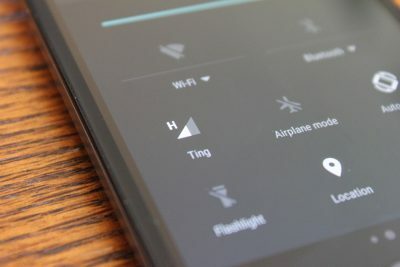 Depending on the carrier and location, it uses voice over LTE (VoLTE) when possible, which routes voice calls over a LTE data connection. The additional speed provided by LTE enables Samsung and most carriers to use wideband audio, often marketed as HD Voice, to provide clearer calls. Even when HD voice was not in use, calls sounded great overall. We found that the reception was also very good – in locations where some other devices struggled to find a signal, the Galaxy S6 was typically able to maintain a connection. The headset speaker sounds good and the microphones and ambient noise cancellation work well – the person on the other end of the call can easily hear you in most environments. 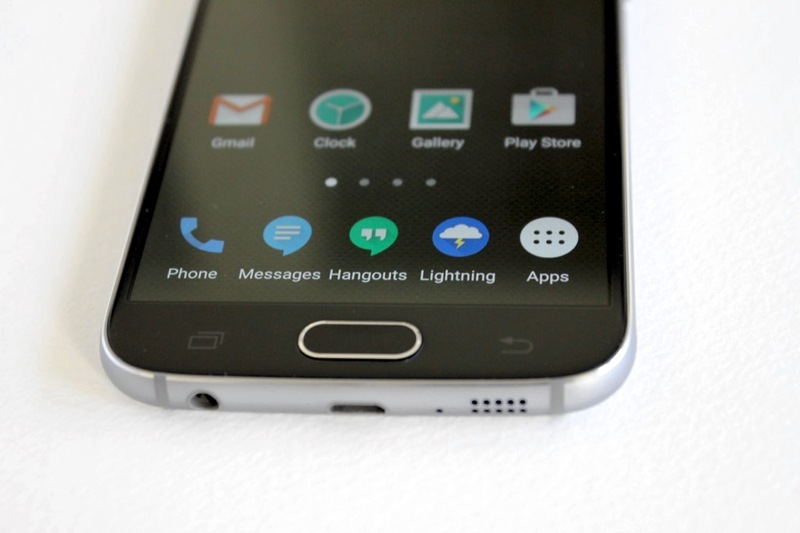 Unfortunately, the battery life of the Galaxy S6 is not very good. 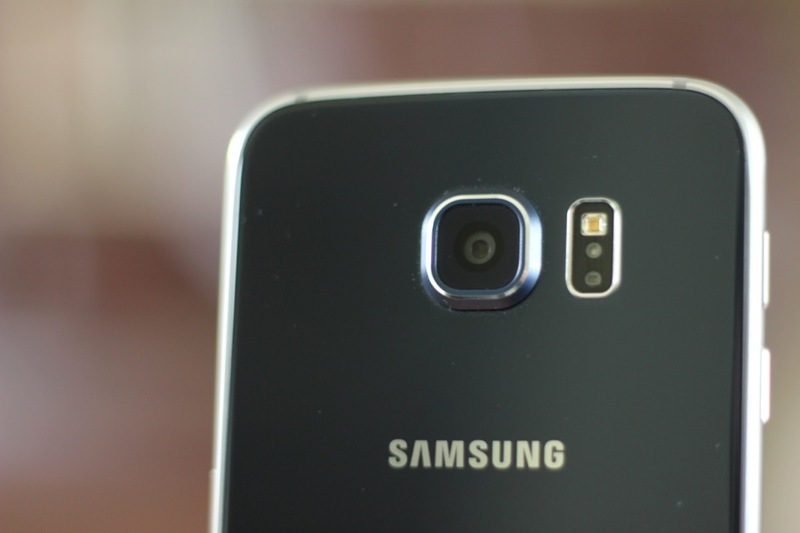 For most people the Galaxy S6 will not last an entire day without requiring a charge. For light users with few apps installed it should last one full day. For power users who need a phone to last all day with heavy usage, the larger phones from Samsung like the Note or Edge Plus are a better choice. 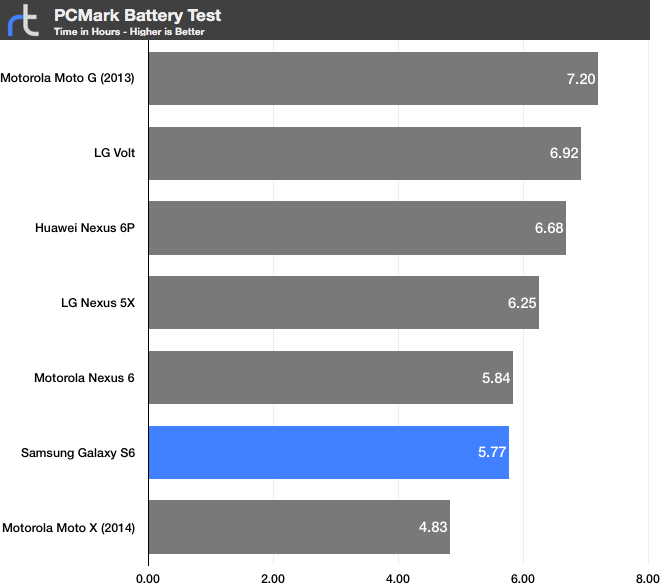 To look at battery life with a more objective test we turned to PCMark’s battery test. The phones’ screen brightness were calibrated to the same level (200 nits) prior to testing. The following chart shows how the Galaxy S6 stacks up compared to some other Android phones. As we noticed in our everyday use, the Galaxy S6’s battery life is short. The Galaxy S6 does have quick charging as well as wireless charging which are very convenient. The phone can charge from 0-25% in less than 15 minutes. Typical charging times are shown below. Notice that it charges very quickly from 0-75%, taking just under 45 minutes. At around the 75% mark, the charging slows down, so that the remaining 25% to get to a full charge takes an additional 35 minutes. We ran multiple tests with the Samsung charger as well as a third party charger, the Aukey Quick Charge 2.0 charger, and all tests were very consistent. The Samsung Galaxy S6 is an excellent smartphone that sports an attractive design, the best smartphone display to date, and one of the best phone cameras yet. Other than poor multitasking, performance is great overall. However, the thin design sacrifices battery capacity and even with available themes, some may prefer a phone that provides a more stock Android experience. Description: Samsung's redesigned Galaxy S6 is a premium smartphone that looks and feels great, takes excellent pictures, and performs well. Even though it is plagued with mediocre battery life and poor multitasking it is still one of the best smartphones of 2015.